Is baile tuaithe agus turasóireachta i gContae Maigh Eo é Tuar Mhic Éadaigh. Tá thart ar 1,000 duine ina gcónaí ar an mbaile. 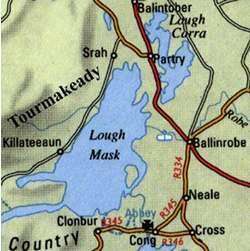 Bhí chuid de bhaile Tuar Mhic Éadaigh i gContae na Gaillimhe, ach cuireadh faoi chúram Contae Maigh Eo é in 1898. Tá siopa grósaera agus Oifig an Phoist i lár bhaile Tuar Mhic Éadaigh. Tá neart Tithe Tábhairne agus Bialanna ar an mbaile freisin. Tuilleadh eolas le fáil faoi na nascanna ar thaobh na láimhe clé an leathanach seo. Tá cáil ar Thuar Mhic Éadaigh maidir lena chuid radharcanna breátha. Tá an baile suite idir Loch Measca agus Sliabh Phartraí, a chlúdaíonn limistéir ón tSraith go dtí Mám Trasna. Tá cáil freisin ar Thuar Mhic Éadaigh maidir lena chuid iascaireacht, siúlóidí, agus an t-eas nádúrtha atá i gCoill Thuar Mhic Éadaigh. Tá an baile 26Km (16 Míle) ón Aigéan Atlantach. Comhdhéanann Tuar Mhic Éadaigh agus baile Partraí Paróiste Baile Óbha. Tá baile Tuar Mhic Éadaigh mar bhall den Tóchar Valley Rural Community Network.